TKOB for the first time, in cooperation with the Greek Embassy in Tirana, brings a completely unique production that will bring to the stage the most beautiful songs and Greek and Albanian traditional music , under the accompaniment of the Big TKOB Orchestra and the direction of Greek conductor, Eleftherios Kalkanis. 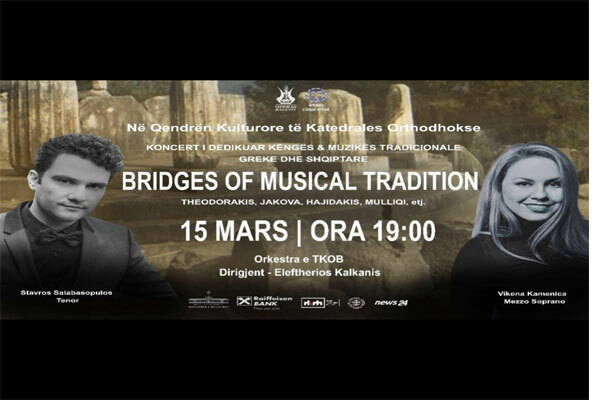 Featuring half soprano, VIKENA KAMENICA and Greek tenor, STAVROS SALABASOPOULO, that will bring together the most beautiful repertoire of traditional songs of our two countries. The event takes place in the hall of the Orthodox Cathedral. You can book with a sms in the inbox on the Facebook page or in the phone number 067 63 27 313.